Team AYEINA along with couple of Muslimah bloggers and crafters collaborated to bring this blog post together. 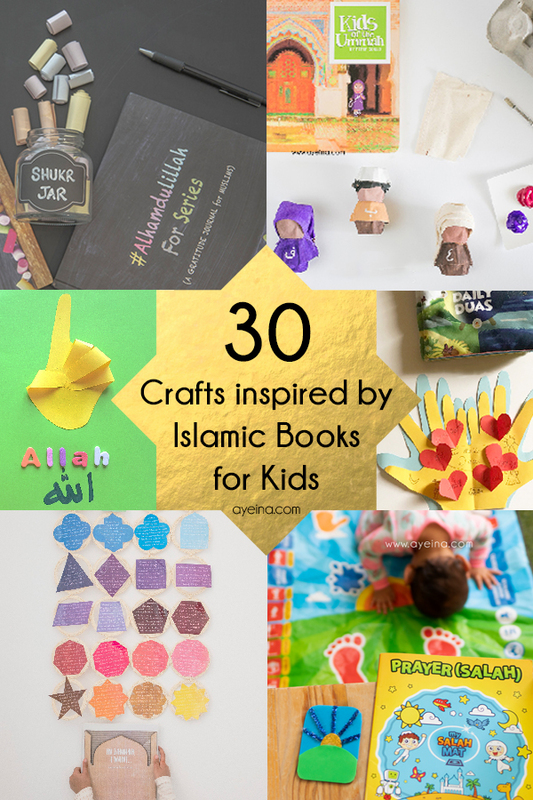 Everyone chose one of their favourite children’s Islamic books and did a craft related to it. If you have a favourite book that we haven’t mentioned here, feel free to submit your craft to editor @ ayeina . com 💞 and write down instructions and experience with a brief intro to the book and how your child engaged with it (all crafts should be original and not published anywhere else). Please note that there are so many amazing Islamic books for Kids out there, but we could only include the ones we personally owned, but this is an ongoing series hence we’ll be doing more of these in shaa Allah. Jannah journal by ayeina.com is designed around 5 senses (sight, sound, smell, taste and touch/feel) to help kids widen their imagination from different perspectives. When children will understand how their senses work in this world and the kind of super powers Allah has blessed animals with, it will be easier for them to be more creative in their thinking. Since the base of human creativity is colours and shapes, the whole journal revolves around them (also to avoid illustrations of Jannah which may inhibit kids’ imagination as we can never do justice to what Jannah will be like). Each of the 5 senses is followed by a journaling section that focuses on that specific sense with a dua of Jannah to memorise. You can see further details HERE. Materials needed for the rainbow shapes-calendar craft: Ikea scarf hanger (you may take any board or big chart paper), Jannah Journal (to cut out the colorful shapes from), scissor, tape, hook (for hanging the hanger). 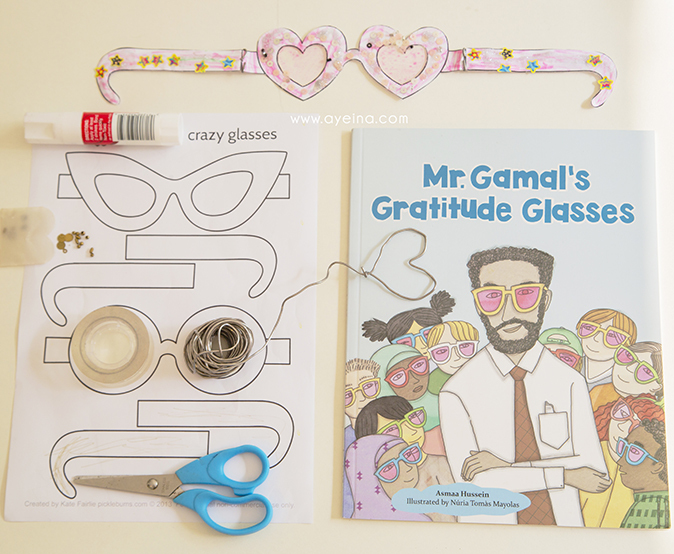 Mr.Gamal’s gratitude glasses by ruqayasbookshelf.com is a story about a teacher whose students are grumpy so he wishes to help them look at their lives more positively. He introduces kids to the idea of Gratitude Glasses and wonders if these special spectacles will help his students see things they couldn’t see before? The positive side of each scenario…My daughter loved this book because we are already obsessed with the idea of positive mindset since 2015 – when we published our gratitude journal for kids! We usually take this book out as a complimentary story to our shukr journaling. Materials needed for gratitude glasses craft: Paper (card-stock is better for durability because ours barely lasted a week :p), soldering wire for fixing it on the face, stickers and sequins, glue and scissor. (pink gel paper is optional but it would add a nice effect to glasses). What to do: Draw glasses or cut them out from a free printable. Support it with soldering wire behind it and decorate it with sequins and stickers etc. Although prayer (Salah) activity book by mysalahmat.com came with an interactive prayer mat (that my one year old is doing sajdah on :p I spread it out to take a shot and since she watches her elder sister pray on it, she fell into prostration as well ❤️), but they are also sold individually. The Activity book includes puzzles, crosswords, key words in Salah, prayer times, adhan, wudu, salah process, surahs, duas, quizzes, colouring pages and so much more. Materials needed for the prayer mat craft: Foam board, glitter pipe cleaners, glue gun (because white glue doesn’t work so well with this craft) and scissor. What to do: Cut blue, green and glitter gold foam board along with blue pipe cleaners (depending on the size of mat you are making) and glue them all together. Let kids do the cutting, but make sure you glue it for them if they are small and don’t know how to handle a hot glue gun. I chose “My Salah Mat” design, but you may choose any other design if you’d like. 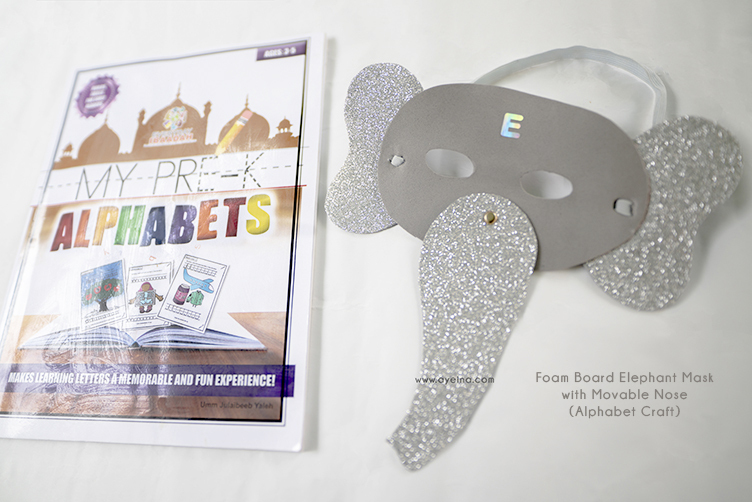 Materials needed for the animal mask craft: Foam board, brad, elastic band, scissor and glue (letter E sticker is optional). 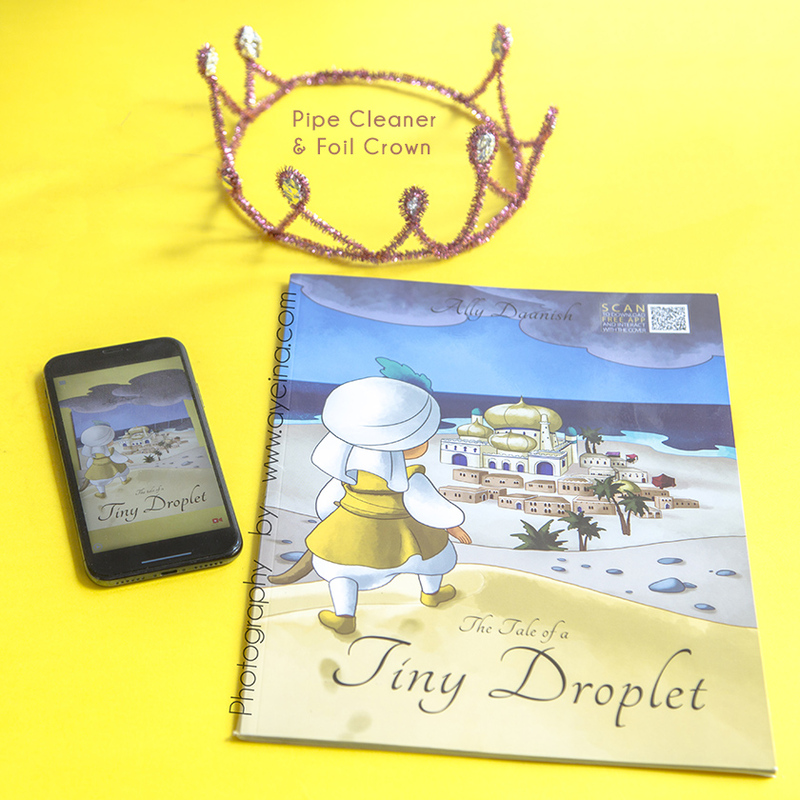 The tale of a tiny droplet by lotehouse.com is a story of a water drop who is ridiculed for being so small and yet having such big dreams, takes a brave journey to live in a bright kingdom. It’s a journey of how it turns into a pearl and sits in the crown of a queen. The book touches on themes such as trust in Allah, Allah’s creation, humility and pride, parents, friendship and companionship. Science is also explored in an easy-to-understand way.​ It comes with an interactive book app as well. What to do: Take two (or more) pipe cleaners to make the circular base of the crown (according to the size of your child’s head). Take smaller pipe cleaners and start twisting them in the shape of oval holes which can be filled with a crumpled foil (as pearls). Attach all the smaller twisted pipe cleaners to the base of the crown by – yes you got that right – twisting them. 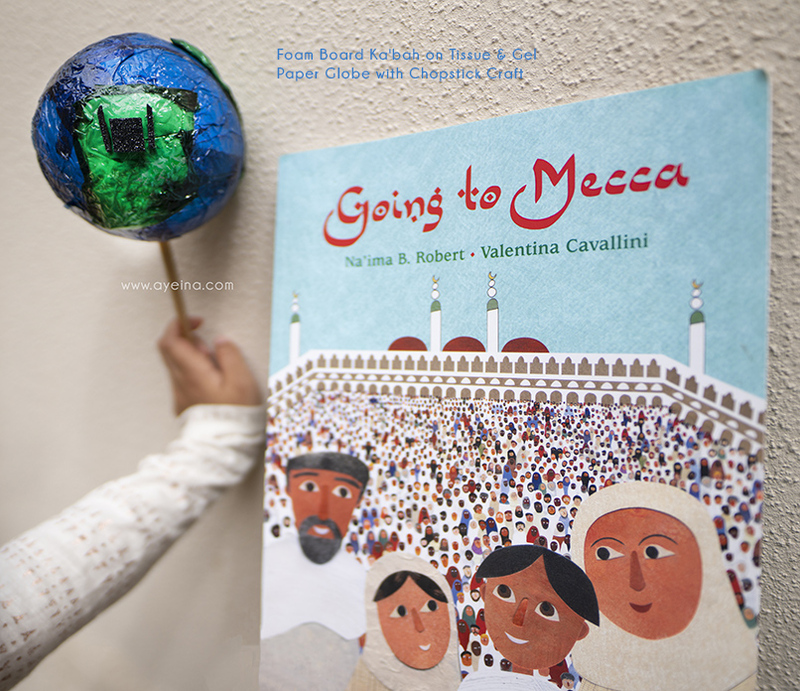 Going to Mecca by Na’ima B Robert is a beautiful poetic book about a sacred journey for Muslims from all over the world. I bought it from Amazon and gave it as a gift to my daughter who fell in love with its illustrations. It’s perfect for read-aloud sessions because its not very wordy and rolls smoothly on your tongue as a poem does. Materials needed for the globe craft: Ball (either take an old ball or crumple newspapers together to make a ball), chopstick,tissue papers, white glue, gel papers, black glitter foam board (or cardboard/cardstock) and scissor. What to do: Cover an old ball with tissue papers to hide the design (if there is). Cover the land with green gel paper and water with blue gel paper. Cut the Kabah inspired foam board shape to stick on the globe. Insert a chopstick underneath to make a globe stick (that almost looks like a lollipop 😀 I think I’m just hungry while writing this). 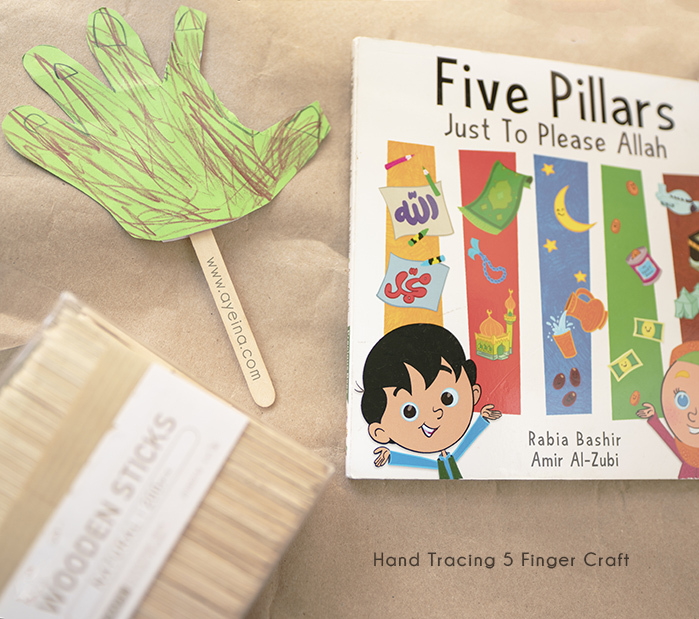 “Five Pillars – Just to please Allah” by preciousbees.com is a rhyming board book with recurring “just to please Allah” and “your home will be Jannah”. My daughter has memorised the whole book. There are flaps in the end that a child can lift to find each pillar name written beneath – shahadah, salah, sawm, zakat and hajj. Materials needed for the hand prop craft: Cardstock (even simple paper would do), wooden stick, scissor and tape. What to do: Let your child trace their hand on the paper and cut it out. Let them color it and then tape the wooden stick behind their hand art to make a five fingers – five pillars prop craft. 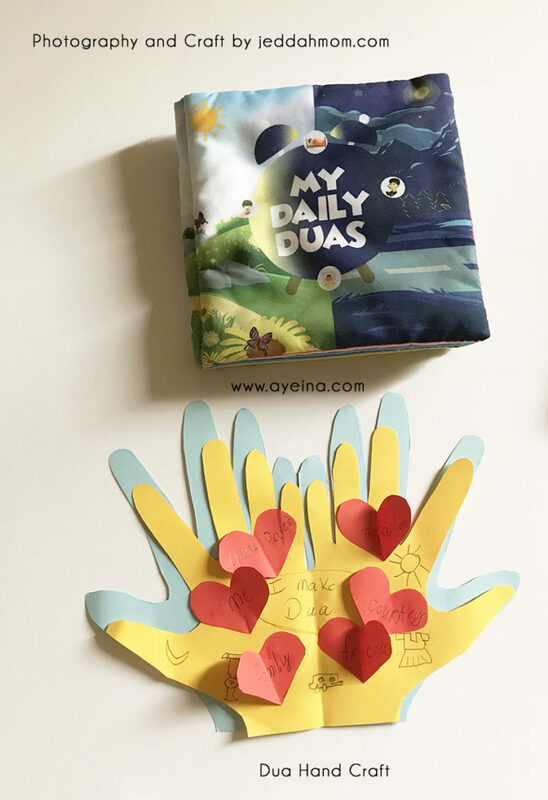 Jeddahmom.com chose the book “My Daily Duas” by Ummi and Baby Co. which is a soft cloth book containing daily adhkaar that little children can memorise. It is suitable for babies to preschool level. Materials needed for the dua hands craft: card stock, coloured papers, glue, scissor and colour pencils, markers or crayons. which will hold duas for all the people to make dua for. We made 6 hearts with the words me, family , grandparents, friends, teachers and country. My daughter loves to doodle so she drew some pictures too. allflouredup.com chose the book “Prophet’s Pond” by Learning Roots which is a beautiful story of a boy, who, with the help of this mother, goes in search of a specific pond in the hope of meeting a ‘special someone’. He describes one characteristic of the pond with each turn of the page, never quite finding the right pond, until his mother discovers he’s actually talking about a pond from the hereafter. It’s then that the adventure reaches it tear-flowing climax in the realisation that her son longs to meet the Prophet Muhammad (S). Materials needed for the sensory bin activity: Tub (ideally white colored), 1/2 gallon water (for sight), honey (for taste). essential oil – lavender/orange (for smell), pebbles (for touch), Ice cubes (for feel), 2-3 small cups (for sensory play). What to do: Fill the tub with water. Lay out the items needed for sensory play over a sheet or some old towels. 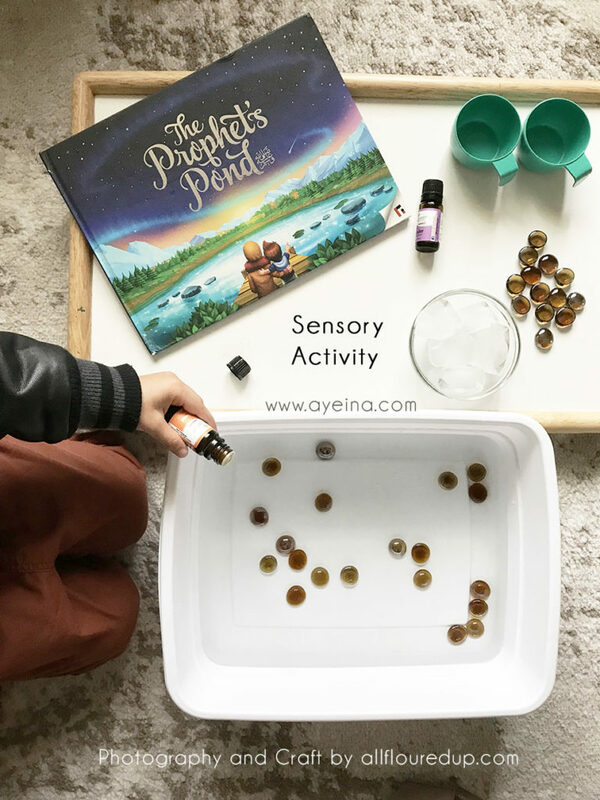 Essential oils for scent (lavender and orange are both kid safe), ice for cold, mini cups for pouring and dipping, honey (over 1 year olds) for sweetness, and some rocks or pebbles to add some fun. Allow your child to explore and experiment. 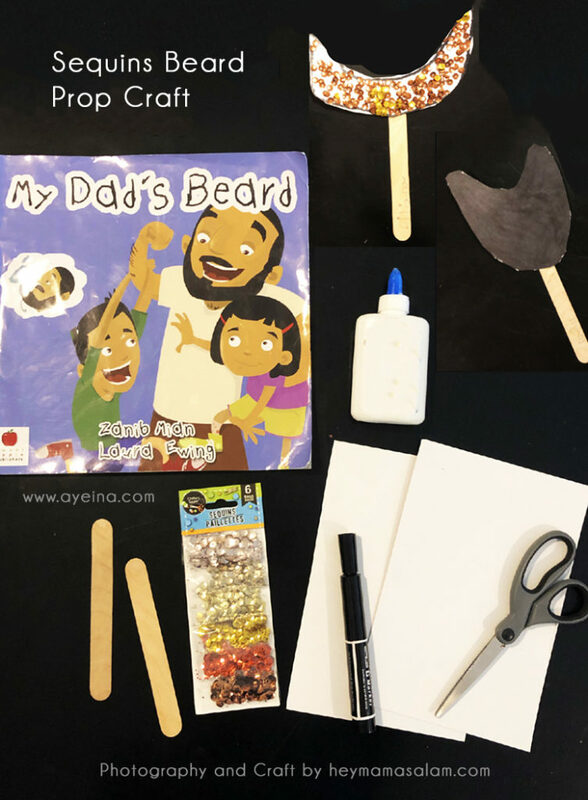 heymamasalam.com chose the book “My dad’s beard” by Zanib Mian, which is a cute read-aloud book honouring the male figures in the family while glorifying the Sunnah of keeping a beard. Materials needed for the beard prop craft: sequins, cardstock, glue, wooden stick, scissor and marker. What to do: Decorate a beard (short or long, black or brown), cut it and stick it on the wooden popsicle stick. theoddmuslimah.com chose her own board book “I love Muhammad (saw)” designed by AYEINA 😀 – It’s a rhyming book about why we love our last prophet. So we sat and talked about all the things we could think of about Rasulullah SAW and wrote them down. I typed and printed the words in blank block letters so Mr 5 could practice his writing but he wanted to colour instead (so much for unschooling). Anyhow we cut out the words and pasted them onto cardstock cut in shape of petals. The petals were arranged around a circle and glued together and then taped onto a wooden craft stick. We even glued a cardstock leaf at one end. Now we couldn’t decide how to display our creation so Mr 5 said we put it in a pot. We stuck it in there with the help of some playdough. And it stood quite well. InshaaAllah I hope things taught through this craft stick with children. zedandq.com chose the book “Don’t forget to say” by kokab books, which is a story about a little boy who loves to go exploring. A giggle-inducing story with duas embedded within, makes it an educational book as well. 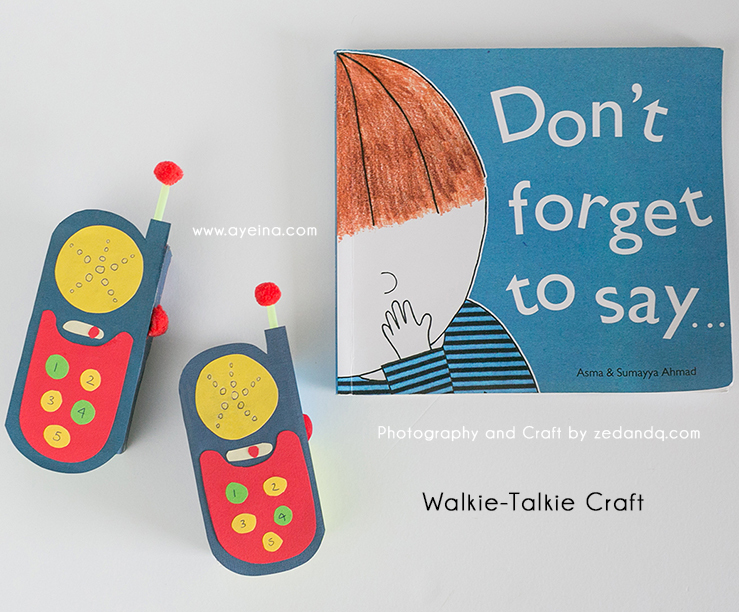 Materials needed for the walkie-talkie craft: colourful cardstock, juice box, straw, pompom, glue, scissor, pencil colours/markers. What to do: Cover the juice box with walkie-talkie cardstock and glue a pompom over a straw to start talking to your child across the room! @kitabkids chose the famous book “Golden Domes and Silver Lanterns” by Hina Khan, which is a rhyming book that captures the world of Islam, celebrating its beauty and traditions. 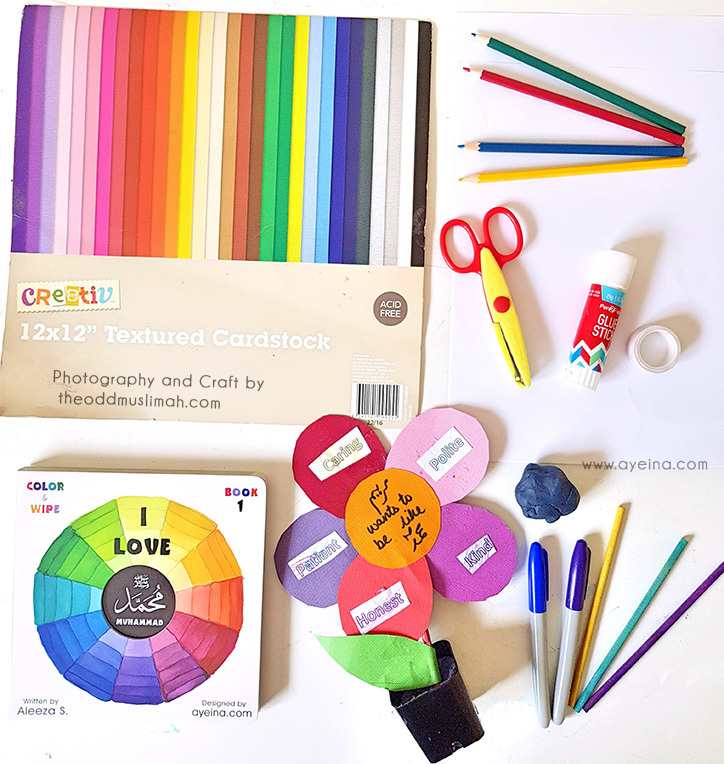 Materials needed for the mosque craft: glue stick, scissor, assortment of papers in your child’s/children’s favourite colours (preferably in a range of prints and textures), cardstock, markers. What to do: Draw an outline of masjid and crescent etc. Cut out shapes from a collection of papers and old gift wraps. Collage them on a piece of thick card. Decorate with stickers etc. 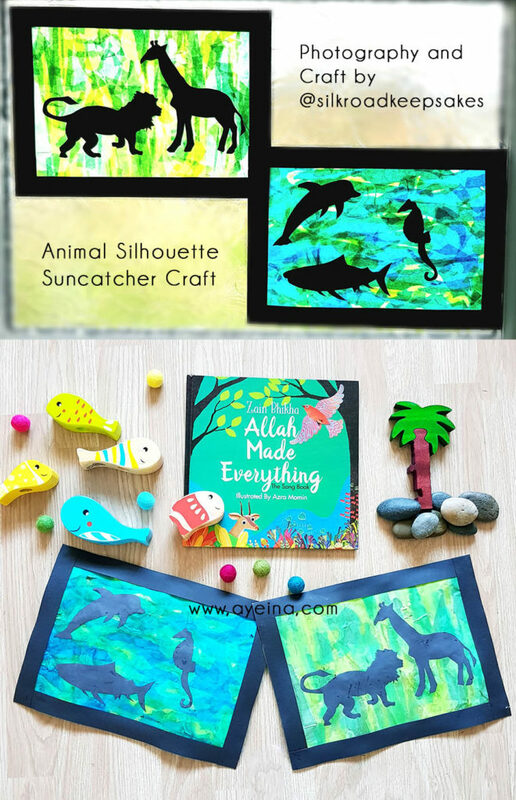 @silkroadkeepsakes chose the book ‘Allah Made Everything’ – published by Kube Publishing. It is a songbook based on Zain Bikha’s famous nasheed. We chose to make bright ocean and jungle themed suncatchers inspired by this book. The craft was simple enough for my three and four year olds to get involved in and the results were very effective. What to do: Tear the tissue into small strips. Cut open the punched pocket along the edges, and cut off the strip with the holes in it. You should be left with two A4 sheets of plastic – 1 for each person doing the craft. Mix the Pva glue with water – 1 part glue to one part water. Using the glue mixture, stick the strips of coloured tissue all over the plastic sheet, making sure there aren’t any gaps. While this is drying, cut the black card into strips to create a frame around the finished piece. Also draw and cut out the silhouettes of animals you would like in the suncatcher. Stick the strips of card around the edges of the suncatcher and trim off any excess leaving a neat frame. Once it’s dry, the suncatcher can be placed on any sunny window using sticky tack. 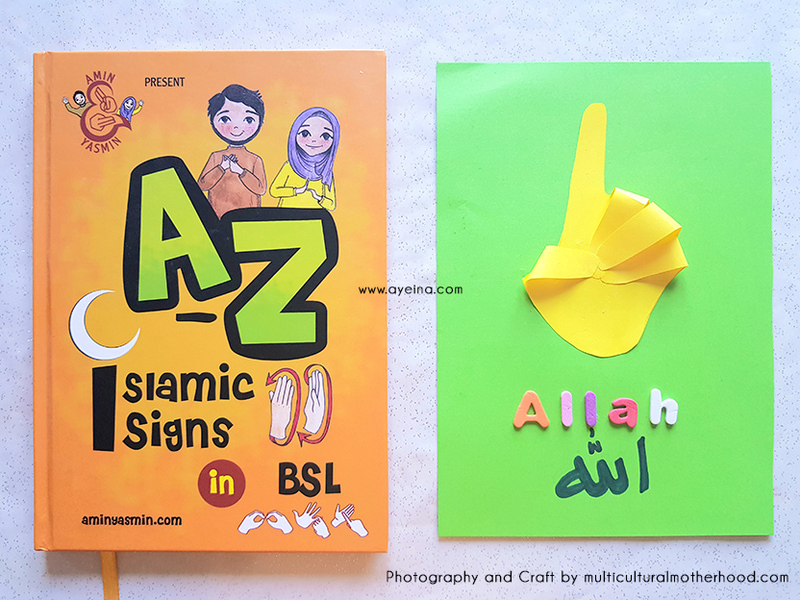 multiculturalmotherhood.com chose the book “A to Z Islamic signs in BSL”, which is an educational book by aminyasmin.com containing beautiful illustrations of signs in BSL. Some of the signs that are included are Eid, family, angel and Creator. We made this following craft to represent the sign for Allah. Materials needed for the hand craft: cardstock, paper, scissor, glue, foam letters (optional). What to do: Draw around your child’s hand and cut it out. Stick down four of the fingers, leaving the index finger pointing upwards (as a sign of shahaadah). This is the sign for Allah. You may also stick foam letters underneath to say Allah and write Allah in Arabic. 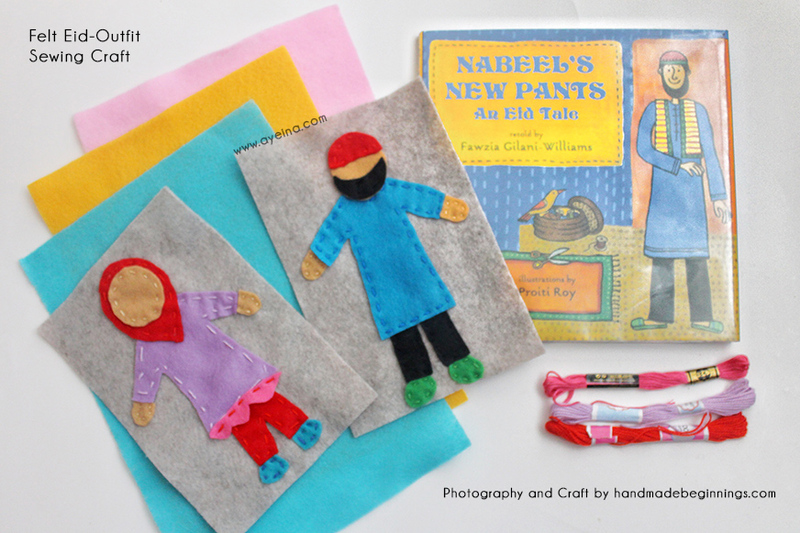 handmadebeginnings.com chose the book “Nabeel’s New Pants – An Eid Tale”, by Fawzia Gilani-Williams, which is a story about a man who decides to buy presents for his family for Eid. He also buys himself a pair of pants, but when he asks his wife, mother, and daughter to hem the pants for him, they are all too busy. In the end he hems the pants on his own, but when he puts them on, on Eid day, he is in for a surprise! Eva says: “My children had fun practicing their sewing skills and designing their dream Eid outfits with felt! They loved the story and thought the end was hilarious”. Materials needed for the felt sewing craft: Assortment of coloured felt, embroidery thread, embroidery thread needle and scissor. What to do: Cut clothing shapes from felt. Thread your embroidery needle with embroidery thread. Tie a knot at the end of your thread. Sew on your pieces to a larger background piece of felt using a running stitch. Make sure to start at the back of your project to hide the knot! You can also mix and match felt colours, embellishments and styles to design Eid outfits while also practicing a basic running stitch with your child. 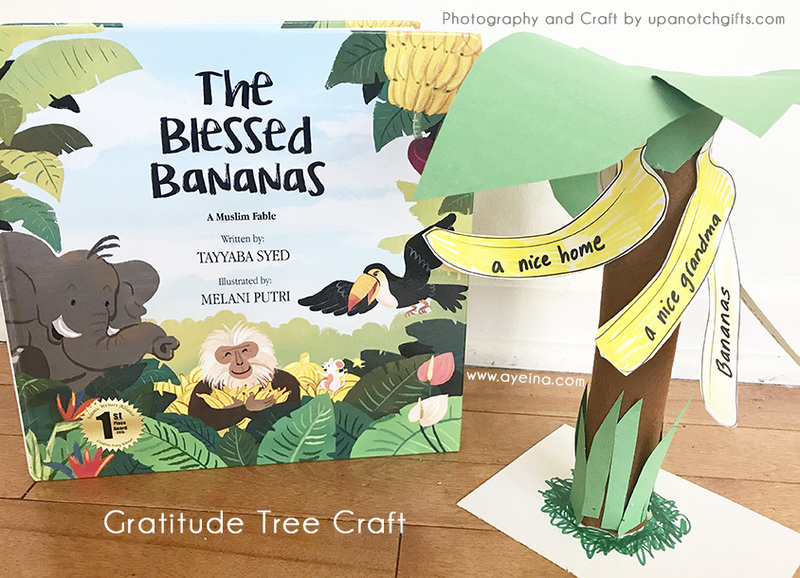 upanotchgifts.com chose the award-winning book “The Blessed Bananas” by Tayyaba Syed, which is a story about a monkey that is arrogant and refuses to share his prized bananas. He believed he deserves the bananas as he had planted and grown the tree himself. His interaction with some animals provides several opportunities for parents to discuss what he did right or wrong. The chaos in the climax of the story is solved by reciting salawat which makes everyone feel calmer. Materials needed for the gratitude tree craft: Empty paper towel roll, green construction paper, glue, banana-shaped cut outs, brown felt (optional), scissor and markers. What to do: Cut the felt to size and glue it to the paper towel roll to make the tree trunk. Draw different shapes and sizes of leaves on green paper and have your child cut them. Help your child cut bananas and write things they are thankful for. Glue the leaves first and then the bananas underneath. Keep adding blessings. The more the merrier. 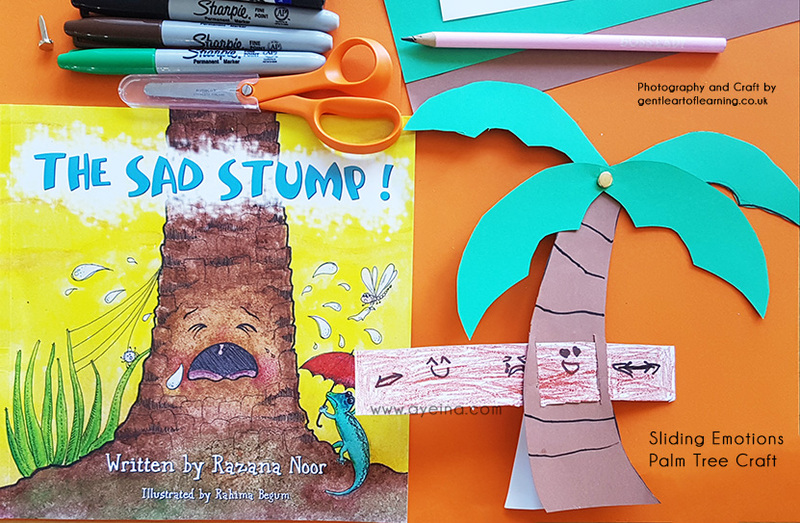 gentleartoflearning.co.uk chose the book “The sad stump” by Razana Noor, which is a true story of the miracle of the sobbing date palm mentioned in a hadith. Materials needed for the sliding emotions tree craft: cardstock, brad, scissor, markers. What to do: Cut out the cardstock in the shape of a date palm. Draw emotions on a strip of paper and weave it through the trunk of a tree to make it sliding. Attach the leaves of the tree with a brad so you can move them as well (optional). @bestofwardah chose the board book “The One, a children’s storybook about Allah” by Manaal Jafrey, which has a beautiful rhyme that introduces some of Allah’s attributes and fundamentals of His creation in a way that a child can grasp. What to do: Have your child draw and colour various things that Allah has created. Use a hole puncher to punch a hole on the top of each drawing except the number one. Tape the number one at the top of the hanger as pictured. 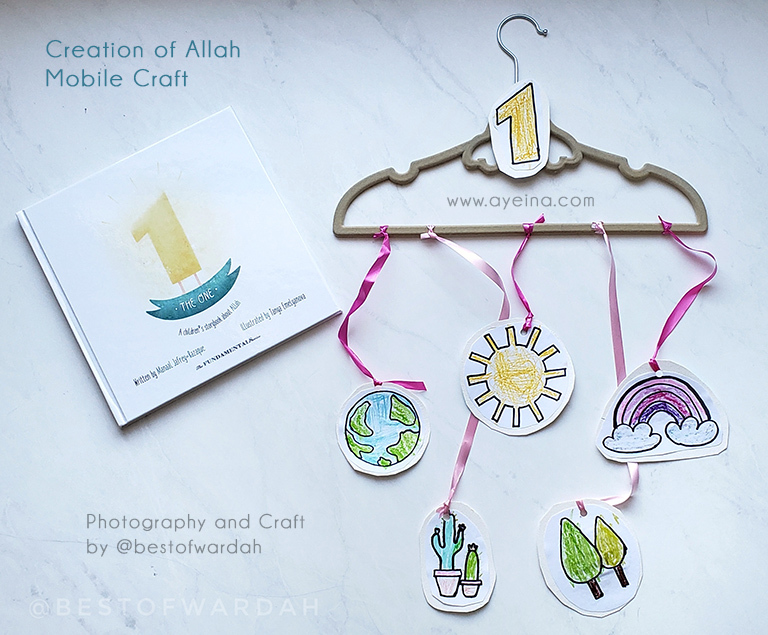 The number “1” represents Allah is 1 – hence it is at the top of the hanger while the things He has created including the sun, Earth, and plants hang below. Use string to attach the rest of the drawings to the bottom of the hanger. Hang up your mobile and enjoy! 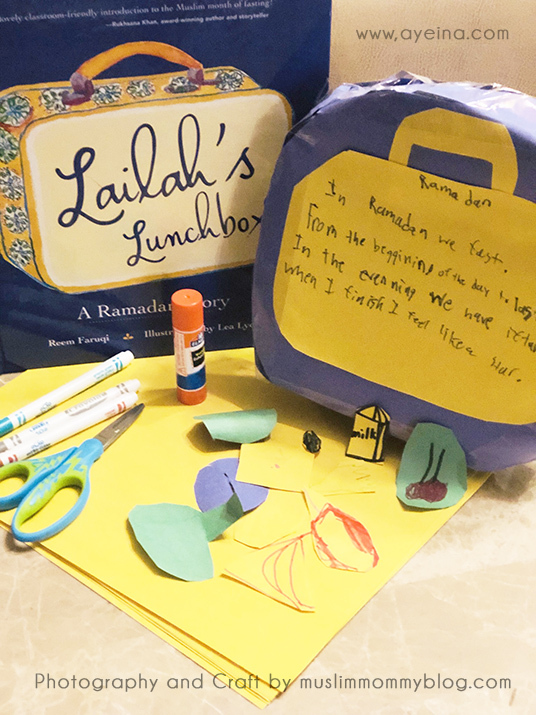 muslimmommyblog.com chose the book “Lailah’s Lunchbox” by Reem Faruqi, which is a story of a young girl who moves from Abu Dhabi to America in Ramadan. With a Ramadan poem within, the book explores the struggle of a school girl having a difficult time expressing why she left her lunchbox at home. Materials needed for the lunchbox craft: Blue and yellow construction paper, scissor, glue stick, and markers. What to do: Trace out the outline of a lunchbox on yellow paper. Have your child cut out the lunchbox with kid-friendly scissors. Glue the yellow lunchbox unto the blue construction paper. 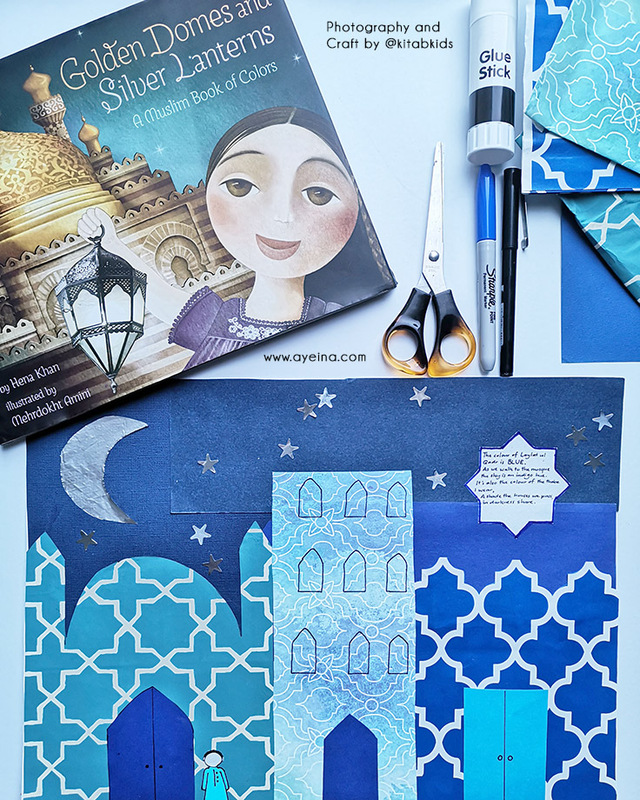 Get markers and have your child write and make up their own poem about Ramadan. Encourage them to express themselves! 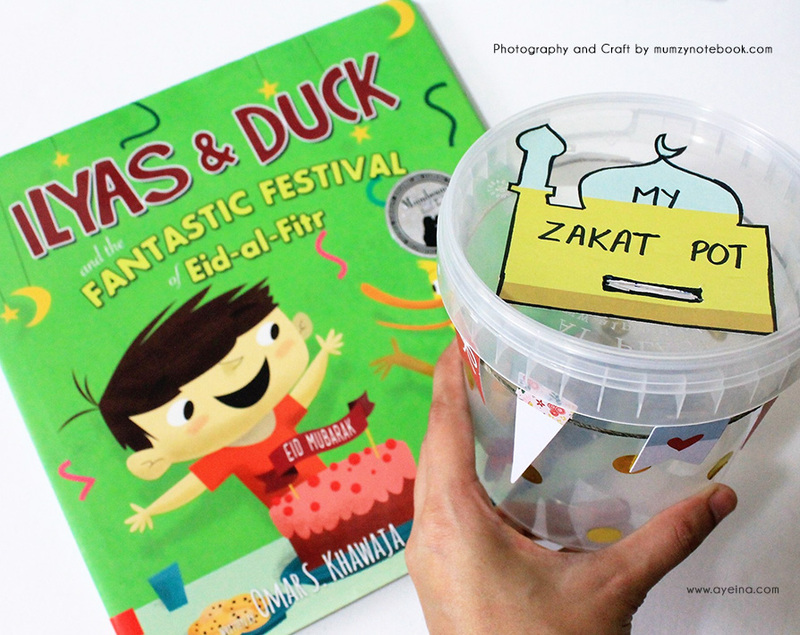 Materials needed for the zakat pot craft: decorating material (stickers, foam boards, pompoms etc. ), paper, marker, cutter, scissor, glue or tape. What to do: We washed an empty popcorn pot and started to decorate it with golden circular stickers (you may take any pot or jar available). Draw the outline of a mosque, cut it out and outline it with black marker. Write on it ‘My Zakat Pot’ and stick it on the lid. Using a sharp cutter, make a slot on the top of the lid, enough to let a coin through and outline the slit with a black marker. 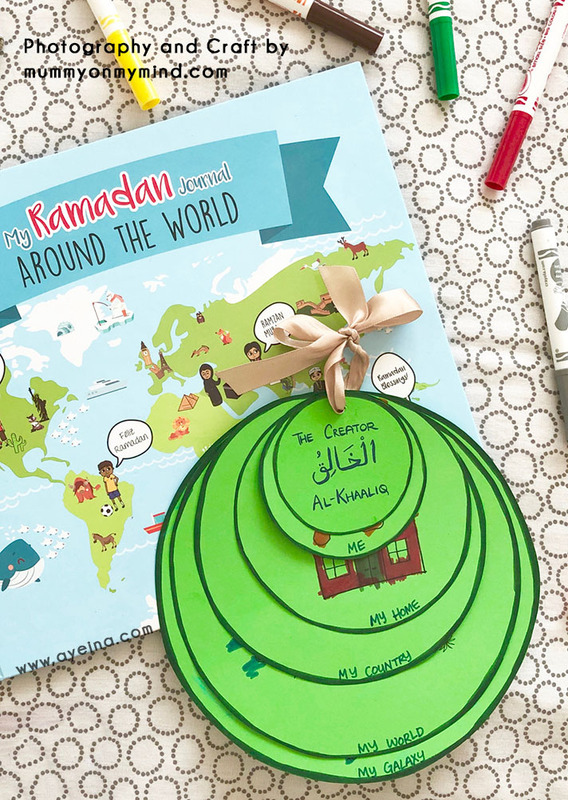 mummyonmymind.com chose the book “My Ramadan Journal- Around the World”, which teaches about the different cultures that co-exist in this world and how there are different ways to celebrate the blessed month of Ramadan. As my four year old child begins to excitedly ask questions about our world, stars and planets, I thought this craft would be a great way to increase his awareness of space and his location in this huge world. What to do: Cut out different shaped circles on some coloured paper – each being bigger than the last and them up with a ribbon. Label each circle as: “Me, My Home, My Country, My World, My Galaxy.” You can add more variations to create a more detailed understanding such as town/city/continent etc. Draw representatives of each of the labels and asked the child to colour them in. Your child can draw on their own too if they are big enough. 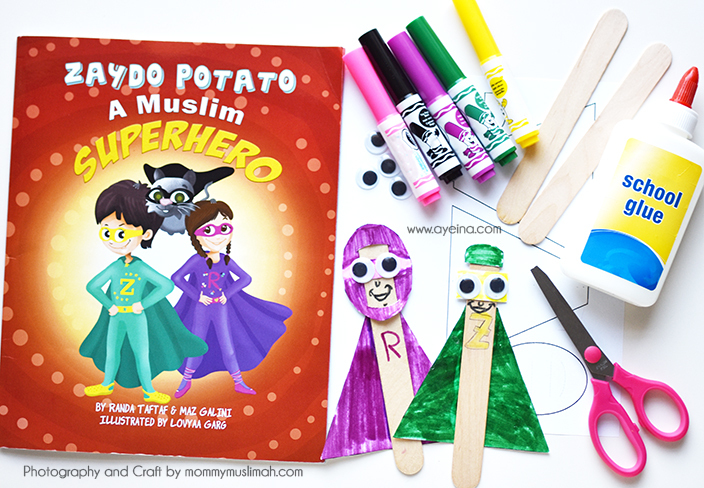 Mommymuslimah.com chose a book called Zaydo Potato – A Muslim superhero – which is about a sibling duo who are Muslim Superheroes. At the start of the book, Raya, Zaydo Potato’s sister is inspired by her brother to become a Muslim Superhero. As the story unfolds, Raya learns a valuable lesson of what it really means to be a superhero. What to do: Print the attached template and cut out all the pieces. Fold the oval piece in half, and cut along the dotted line. Be sure to STOP cutting where the line ends. Color all the pieces (Green for Zaydo Potato and purple for Raya or any other color of your choice). Insert the popsicle stick from the back. Weave the popsicle stick in and out of the slits in the hijab piece (the oval piece is Raya’s hijab) starting at the point that says (Insert Here First). Glue it all together. Decorate the rest of the body to your liking. 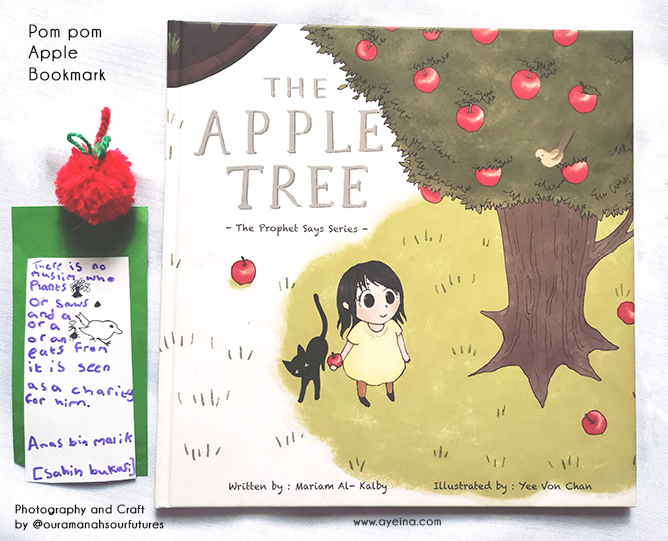 @ouramamanasourfutures chose the book “The Apple Tree” written by Mariam Al-Kalby – which is an adorable book based on a Hadith of the Prophet Mohammed (Saw). The story of a little girl who plants a seed and watches it grow year by year. Will she let her selfishness rule her? Or will she learn a lesson about sharing, caring, charity and reward? @ouramanahourfutures said :”Over the years we have planted many seeds watching them grow and getting eating by caterpillars. My daughter knows from this story that she may be rewarded for feeding those caterpillars”. Materials needed for the apple bookmark craft: a small pom pom (red). cardstock/paper, glue, yarn/wool. Tie green wool around the pom pom into a bow to make the leaf shapes. Now take a colour coordinating piece of card and a white piece to stick on top. Have your child write the Hadith from the book on the white paper. Stick the Hadith onto the colourful card. ilmaeducation.com chose the book “Say Bismillah” published by Ali Gator, which is a story about a little girl who bought donuts for her family but when she got home, the donuts looked so delicious that she forgot to say bismillah and quickly shoved one donut into her mouth. Materials needed for Glitter Donuts Craft: Paper plate, Scissors, Coloured paper, Glue, Colour markers and Glitter. What to do: Cut a hole in the paper plate and have your child colour in it. Cut the coloured paper into a circle and cut a hole in it. Have your child put glue onto the coloured paper and stick it to the paper plate, making sure to match the holes. Add glue to the donut and sprinkle glitter over the top. 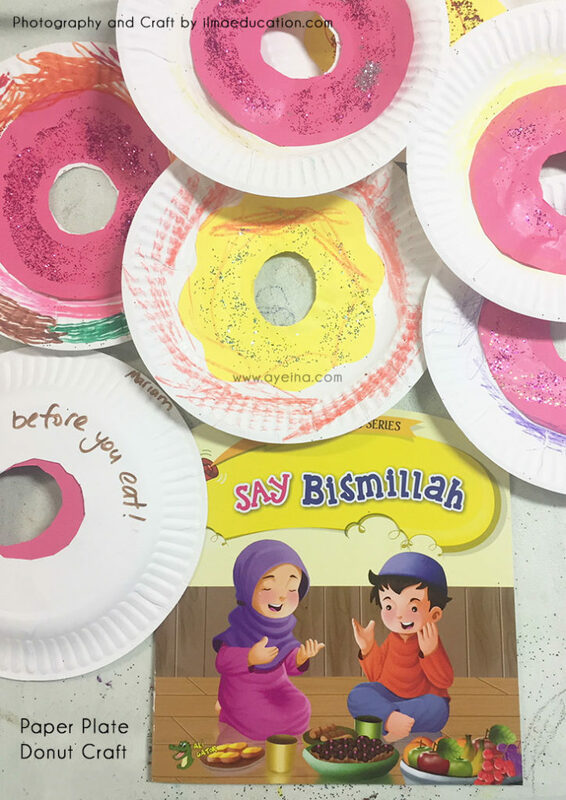 On the back of the paper plate, you can write “Say Bismillah before you eat.” You can also tie a string through the hole and hang the donut somewhere to remind your child to say bismillah before eating. 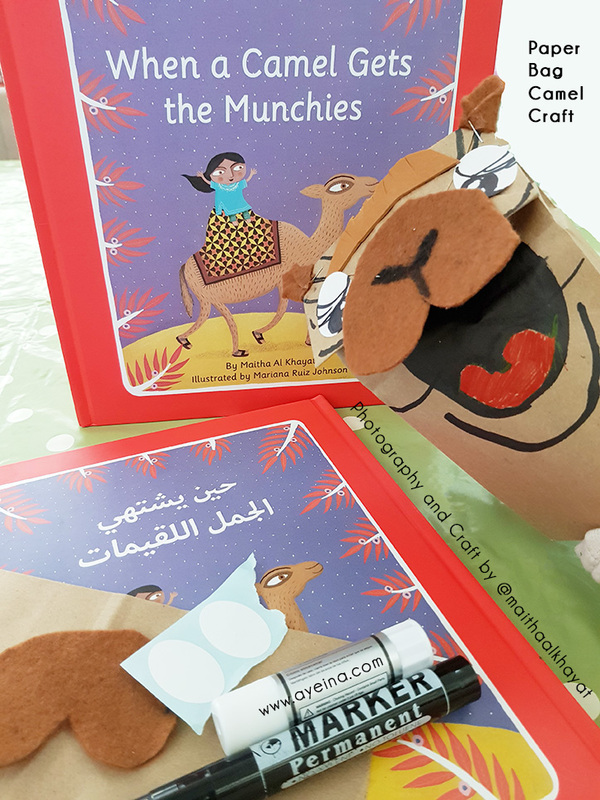 @maithaalkhayat chose her own book “When camel gets the munchies” which is a rhyming story about a bedouin girl who receives a camel as her guest. She tries to play the perfect host even though the camel was a very rude guest who refuses all her yummy Emirati dishes. He only craves the munchies “logaimat”. What to do: Take a brown paper bag to wear on your hand as a puppet. Cut out ears, hair and front of face with felt material (stick them on). Draw the mouth etc. with markers. 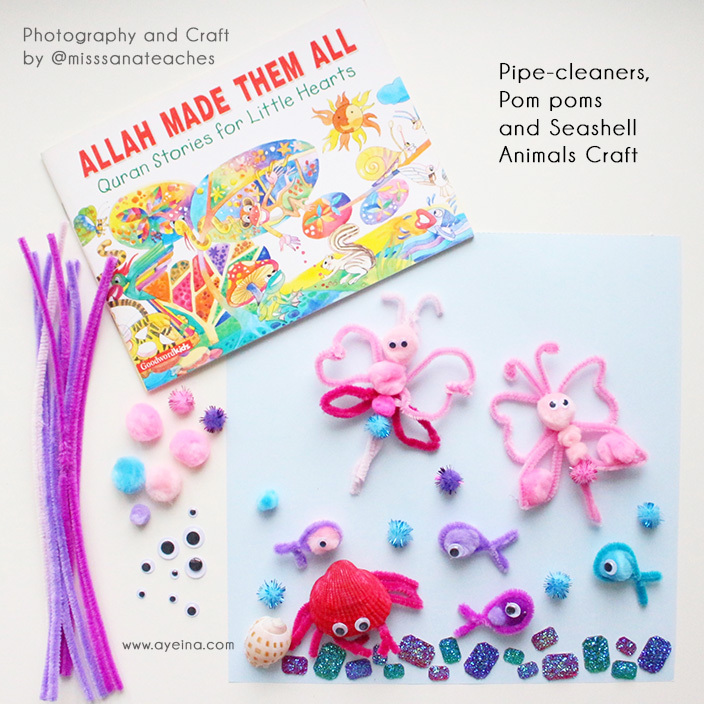 @misssanateaches chose the book: “Allah Made Them All: Quran Stories for Little Hearts” by Khadija Lockhat, which outlines several creatures that Allah has created including animals and insects that live on land and in water. Through this book, children are able to understand the greatness of Allah through his magnificent creations. Materials needed for the Craft: pipe cleaners, pompoms, seashells, glue gun, (googly eyes are optional). What to do: Use different coloured pipe cleaners to create the frame of different animals. We chose to create a butterfly, fish and a crab. Cut and twist pipe cleaners to create wings, antennae, body frames, legs etc. Use a glue gun to stick pieces together and fill the pipe cleaner frames with pom poms. You may choose to use a painted sea shell for the body of the crab and glue the legs to the sea shell. SumairaZ.com chose the book “out of control” by Noor Kids, which is about some students competing against each other and feeling frustrated and angry over their need to win. In the end, the students realize that it takes effort to control your feelings of anger, but doing so is what pushes you ahead of the game! Materials needed for the calm-down slime craft: bowl, cornstarch, hair conditioner, food colour. What to do: Place 2 tablespoons of cornstarch in a bowl and start adding in a little bit of hair conditioner and mix. If the mixture is too thin, then add in more cornstarch and if it’s too hard, then add in more conditioner. Once the mixture comes together, add in a drop of food colour (of your choice) and knead the slime until it’s all one colour. zedandq.com chose the book “the kids of the ummah” by Peter Gould, which is an educational book for preschoolers, showing Muslim characters in 26 diverse cities around the world, introducing children to their A-Z alphabet, and their phonetic Arabic equivalents, helping them become familiar with Muslim names and cultures around the world. 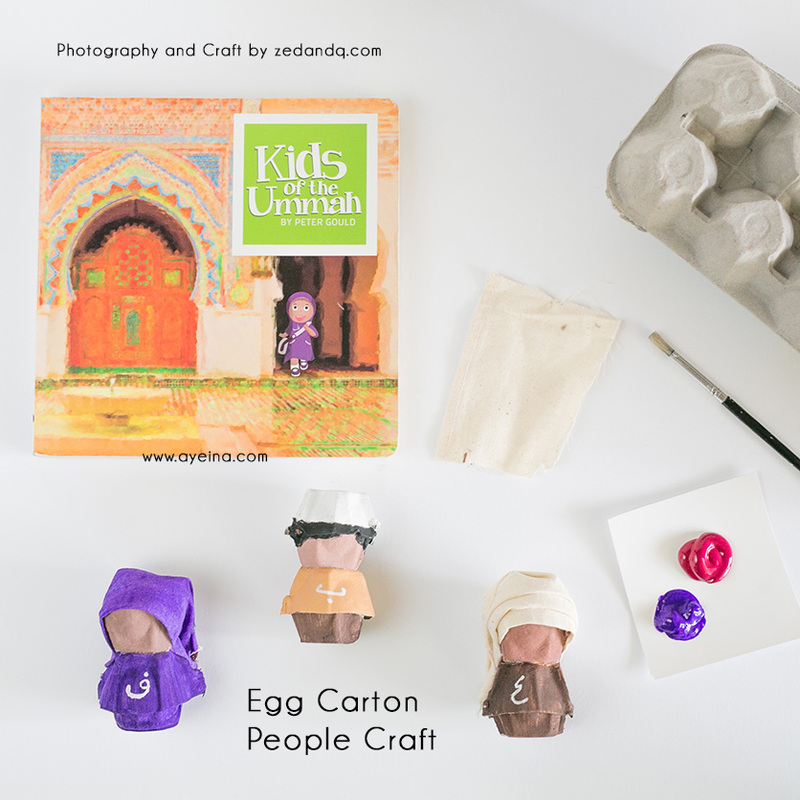 Materials needed for the ummah craft: egg carton, paints, brush, scissor, cotton, or cutter, cloth pieces, glue (or thread if you’d like to sew instead). What to do: Cut out the egg holder from the egg carton and place it on top of each other inverted (for a body). now place another egg holder piece upside down over the body and then glue it together. Fill the head with cotton so it stays put. Paint clothes and initials onto them. Wrap cloth pieces over the head for either a hijab or a kufi. Get creative with decorating. Shukr Journal by ayeina.com is been divided into 4 main categories – basic necessities (so kids can appreciate even the most mundane things in life – like breath, food, home etc. ), relationships (to help kids see the beauty of family and people), Islam (to guide them towards reflection within and associate positivity with spirituality) and everything in between. Kids can fill it up in a month with just one Alhamdulillah a day so they can bring joy in their blessings with an attitude of gratitude. Since the book is full of handmade watercolor illustrations (along with the journaling section), my daughter loves doing individual crafts on each as well (but that’s a post for another day :p in shaa Allah). As we ran out of all the journals (we’ve used a LOT of them since its publication in 2015), we made a shukr jar to continue our journaling. To be honest, it helped me see things from a positive perspective and cope with negative scenarios as well. It’s amazing how a shift of mindset can actually change your whole life. 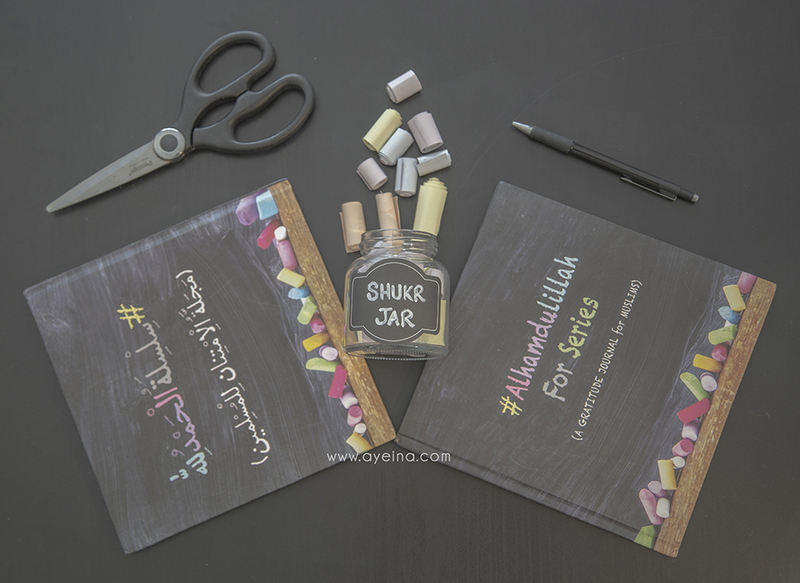 Materials needed for the shukr jar craft: Glass jar (so you are able to see the paper rolls inside), colorful paper sheets, scissor and a pen. What to do: Take an empty glass jar (I took an empty honey jar and converted into a gratitude jar). Write what you are grateful for on thin-cut pieces of paper and then roll them to fit into the jar. It not only serves as a great walk on memory lane, but also brings day to day positivity. If you like minimalism, you can even do just this for the whole month of Ramadan. SubhanAllah! and JazakaAllah for this. This is so helpful. I love this! 30 bloggers working together to bring us 30 books with crafts. So much variety and so much choice! Excellent collection of books and craft ideas! What a great idea ma sha Allah. 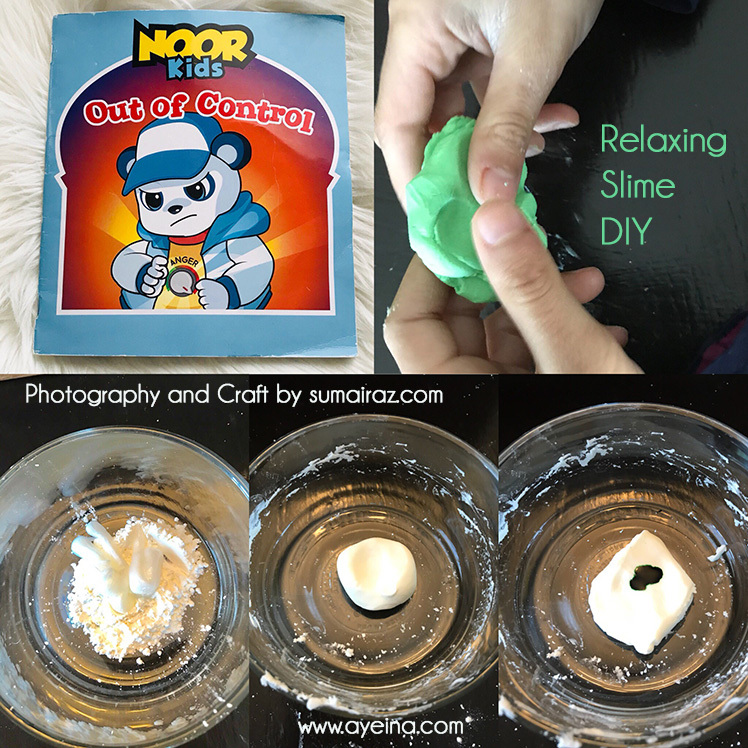 Mash’Allah some excellent crafts…may have to try some of these with my youngest…she would love it as she loves art and crafts!